The carriage left the Metropolitan Railway for the Weston, Clevedon & Portishead Railway by July 1907. At this time end doors and a passageway was added. After the 1940 closure of the Weston, Clevedon & Portishead Railway, the carriage became a garden shed in Shrivenham, Oxfordshire. It was moved to the London Transport Museum at Syon Park in August 1974. Much of the interior had been stripped, though much detail remained on the outer walls of the carriage. Preliminary investigatory work confirmed that the original numbers were Metropolitan No. 353 and Weston, Clevedon & Portishead Railway No. 12. It had previously been thought to be Metropolitan No. 337 and Weston, Clevedon & Portishead Railway No.7. A HLF grant has allowed a full restoration to take place for the 150th Anniversary celebrations of the Metropolitan Railway The carriage was moved to the Boston Lodge Works of the Ffestiniog Railway in October 2011 for restoration work. This was completed in time for the 150 Celebrations in January 2013. 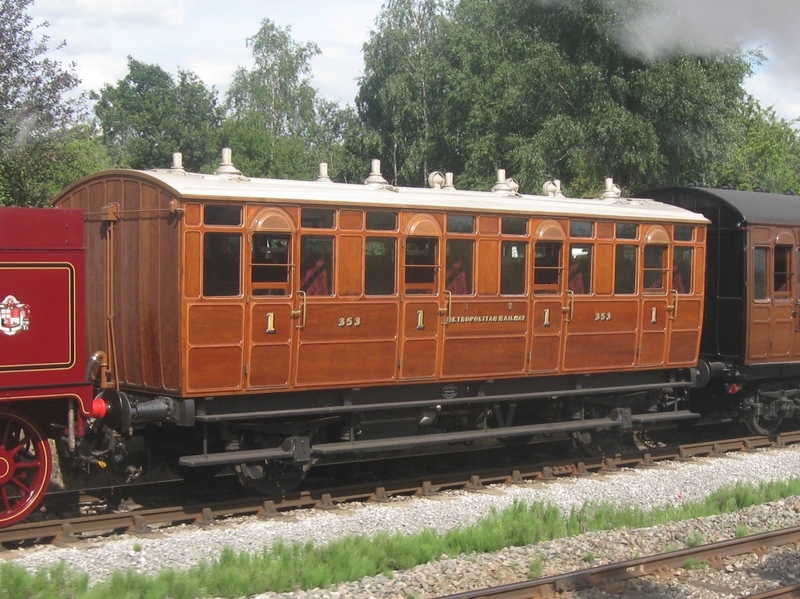 A suitable 4-wheeled underframe (ex BR Southern Region, PMV 1746) was donated by the Quainton Railway Society for use in the restoration of Metropolitan Railway First Jubilee 353. Quainton also loaned a Metropolitan Railway carriage door from another similar Metropolitan Railway carriage to the London Transport Museum restoration team. The team were struggling to identify the type of door latches once fitted to No. 353. None of the originals had survived on 353, but Quainton had a complete door from another early Metropolitan Railway carriage No. 212, which was built by Ashbury in 1881. The loan allowed the team to determine detailed information of the mechanism of the lock. After cleaning and dismantling, it was found that the lock mechanism was designed by Edwin Robert Wethered, an inventor once based in Woolwich, London. It closely matches his patent: 407,268 submitted in 1889. Note that Metropolitan No. 212 was one of the last 8-wheeled carriages to be operated by the Metropolitan Railway. It was later modified for use as a sleet clearing vehicle and survived into London Passenger Transport Board (LPTB) ownership in 1933. Once withdrawn from railway use, the carriage body was grounded next to staff allotments alongside Aylesbury train station. A door was rescued by the Quainton Railway Society's predecessor organisation, the London Railway Preservation Society, before the carriage was finally broken up in 1967. This carriage visited Quainton for a short stay as part of the Metropolitan 150 celebrations in 2013. It appeared in a pure Metropolitan Railway train with Metropolitan No. 1, Dreadnought Metropolitan Railway Nine Compartment Third No. 465 and Dreadnought Metropolitan Railway Seven Compartment Third No. 427.